Super, super cute. Looks exaclty like the pictures, True to size Comfortable and of fantastic material Fits well Love it, highly recommend to those who are looking for a very fantastic and cute bikini. Absolutely, love this! Fits well and the material is great. Not so much cheeky! 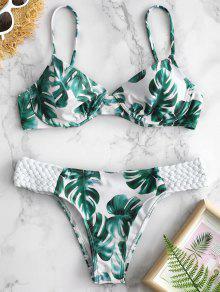 SUPER cute print and love the underwire. Also love the braided sides on the bottoms. For reference these bottoms are more full coverage, so I can wear them around my family! I’m 5’9” and 138 lbs and a 32D and I ordered a medium and it fits great.